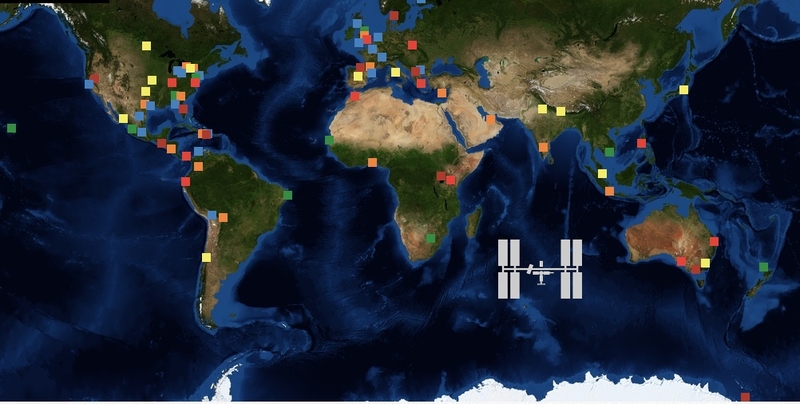 Locations of 2013 Space App Challenge events (Credits: openNASA). On April 20-21, the second International Space Apps Challenge will take place in 75 cities on seven continents and aboard the International Space Station. Begun in 2012 by NASA, the Challenge is an international mass collaboration event. Thousands of citizen scientists and inventors come together for 48 hours of intense technology development. Participants respond to challenges from NASA and 100 partner organizations ranging from designing a useful device that can deploy during a Mars landing to improving air traffic safety. This year, there is a heavy focus on near Earth objects (NEOs), with five of the 50 projects designed around NEO and asteroid themes. Asteroid Hunter calls for a mission concept to explore the asteroid Apophis. The mission is to better predict orbital dynamics and plant a radio transponder on the asteroid for easier tracking in the lead up to its 2029 close approach. Catch a Meteor Tracker will have challengers develop community-based methods to discover and track meteors with the aim of educating and interesting the public in the science and hazards of NEOs. Database of Near Earth Objects is looking for an app or platform to enable crowdsourcing of NEO discoveries in a way that integrates with existing databases. Exploring Asteroids: Planet Hopper is to be an adaptation of the 2012 Challenge app Planet Hopper that allows users to select any planet in the database and instantly see all its basic information. The new version should replace the planetary database with all known asteroids. CubeSats for Asteroid Exploration invites participants to identify near Earth asteroid targets for an exploratory CubeSat mission and create a forum to resolve the challenges such a mission would entail. There’s still time to join the Challenge, so register online, pick a challenge, and get inventing! Afterall, someone has to tackle this planet’s Potentially Hazardous Asteroid problem.